﻿ Best Price on Jungle Creek in Quepos + Reviews! Located on a quiet cul-de-sac half way between the town of Quepos and Manuel Antonio National Park, Jungle Creek offers an outdoor pool and overlooks a creek. 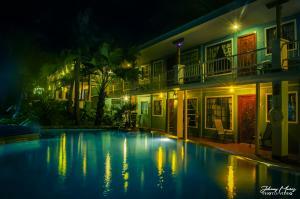 This self-catering accommodations is set in a tropical setting and features free WiFi. Villas are detached or semi-detached and will provide you with air conditioning, cable TV, a balcony and a patio. There is a full kitchen with a microwave and an oven. Featuring a shower, private bathroom also comes with a hairdryer. At Jungle Creek you will find a garden, barbecue facilities and a terrace. Other facilities like laundry facilities and a vending machine are offered. The property offers free parking. You can find shops and restaurants are in the surrounding area. Juan Santamaría International Airport is located 96 mi from the property. Please note the Villa with Private Pool is a detached private house. Please inform Jungle Creek of your expected arrival time in advance. You can use the Special Requests box when booking, or contact the property directly using the contact details in your confirmation.